Want to set your Ducati Superbike 848, 1098 or 1198 apart from the rest? Our easy-to-install four (4) piece Tricolore graphics kit looks great and celebrates Italian tradition and heritage. Available in two (2) color schemes, this kit is precut (NO TRIMMING required) and will detail your bike in no time. 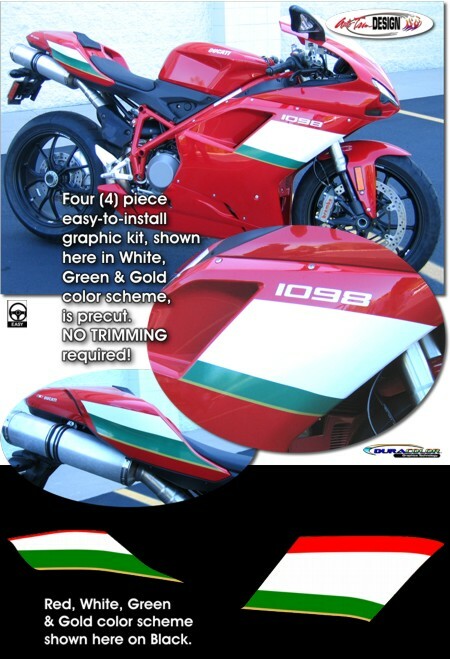 This kit is specifically made for the '07-Current Ducati 848/1098/1198 Superbike and will not fit any other bike.